Banner ads are image ads that appear on the right sidebar, on all pages of the NaijaGlamWedding blog — including the homepage and except the Vendor Directory page. Banner adverts are shown on every post-page of this website. 6 different zones: blog sidebar (including homepage). The advert area rotates two advertiser clients per slot. The advertiser must provide a banner, in the specified size and format. Acceptable Image formats: Static .JPG are strongly preferred and maximum file size 50K, for all banner ad placements that run on the NaijaGlamWedding.com website. We do not support animated .GIFs at this time. Extra Discounts: We offer discounts for ads purchased in multiple months in advance. You’ll get 1 extra month free ad when you purchase 6 full months ad; Get 15 extra days when you purchase 3 full month ad. Get 3 months extra when you purchase 12 months in advance. 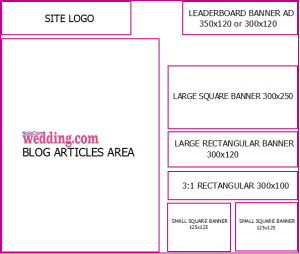 See image below for an idea of where your banner advert will appear on NaijaGlamWedding.com. Presently, we offer 6 different banner advert packages. Below is an overview of the ad specs – the banner sizes, the rates and number of available spots. AND you’ll get 1 extra month of FREE banner advert when you purchase 6 months ad in advance. Get 15 extra days when you purchase 3 full month ad. Get 3 months extra when you purchase 12 months in advance. *Discount offer available for a short time only! **Our advert rates are subject to changes and increase – so take advantage of our low prices today. What Are You Waiting For? Take advantage of our DISCOUNT OFFER for adverts purchased within the next 45 days!